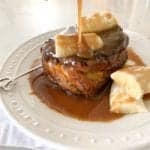 Today I am sharing our breakfast and lunch dining experience at Carnation Cafe located smack dab in the middle of Main Street. 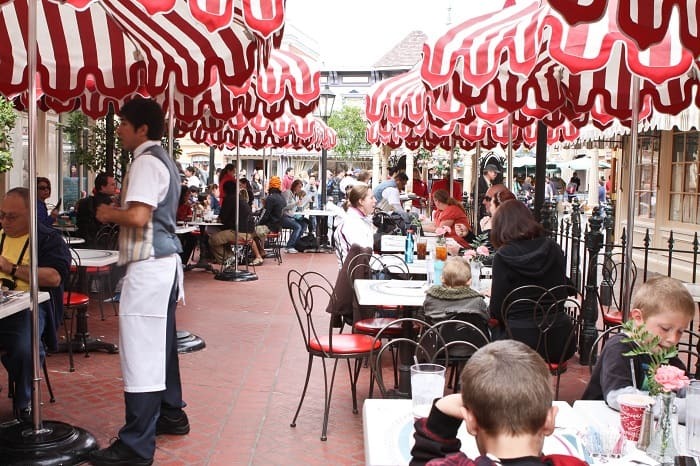 This is a great place for breakfast or lunch if you are a people watcher because you know how Main Street is…..always hopping with activity 🙂 You can’t miss the festive red and white striped umbrellas covering each table. The view from inside the restaurant. It’s an outside dining experience where you sit under cute red and white striped umbrellas and sit on red cushioned cafe style chairs. I appreciated the crayons the servers brought the kids to keep them busy before their food arrived. 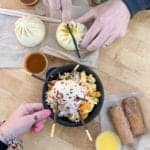 Click HERE to see the entire Breakfast Menu. 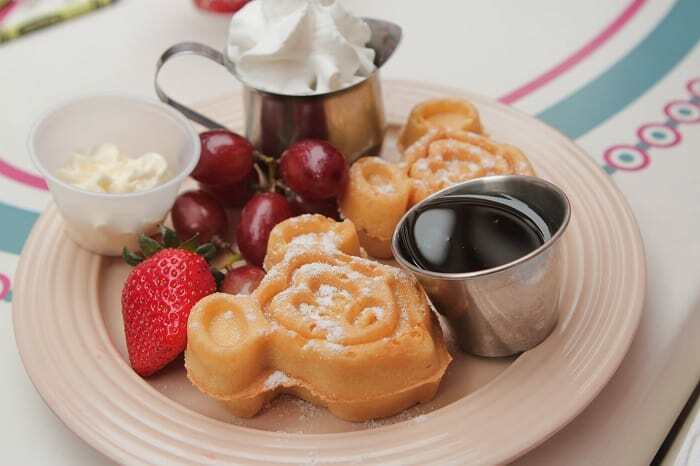 For breakfast, the boys ordered the oh so fun Mickey Waffles with a side of fruit. They were crispy on the outside and soft inside. Great choice for the kids for sure. 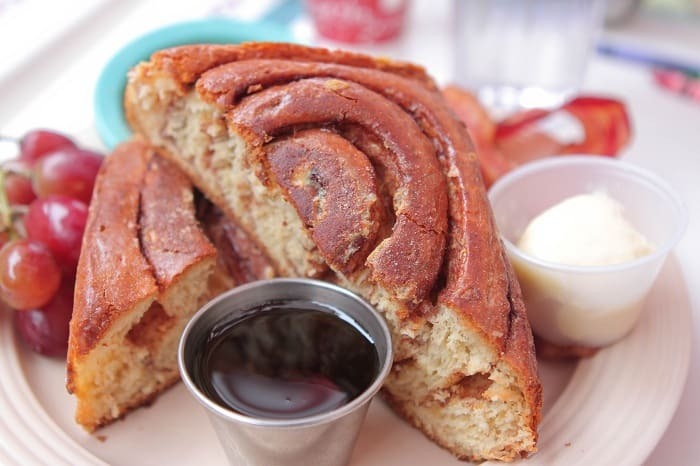 My husband ordered the very famous Cinnamon Roll French Toast. It comes with cream cheese frosting (oh my gosh! ), fruit and bacon. This is a very “sweet” meal. I LOVED it, but would be more inclined to order it for a late breakfast or even dessert. It was really good. 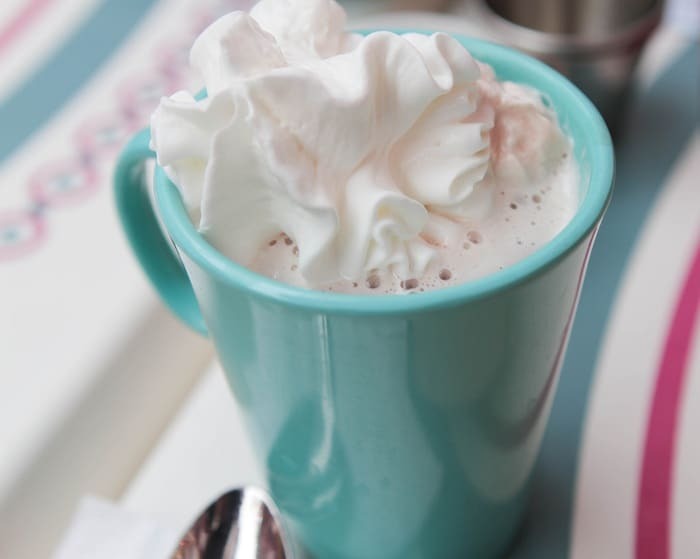 It was a chilly cloudy day when we went for breakfast, so we shared a mug of hot chocolate. It was slurped in about 30 seconds. Great hot chocolate. Here’s the lunch menu posted outside. 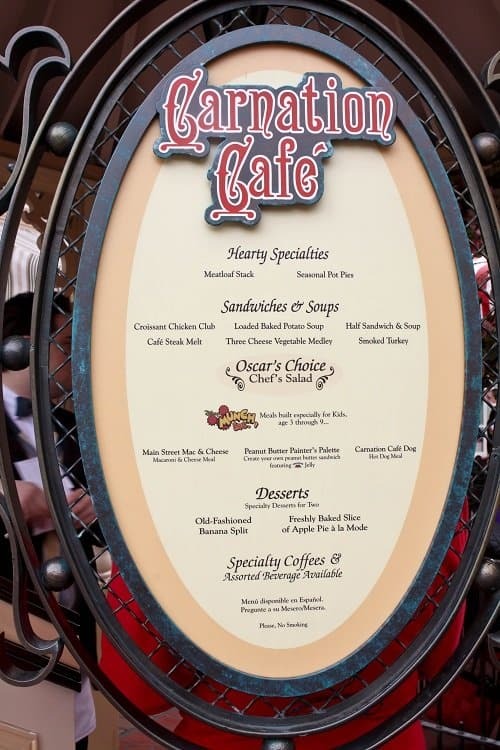 You’ll find lunch favorites such as sandwiches, soups, pot pies, meatloaf and salads at Carnation Cafe along with a handful of tempting desserts. 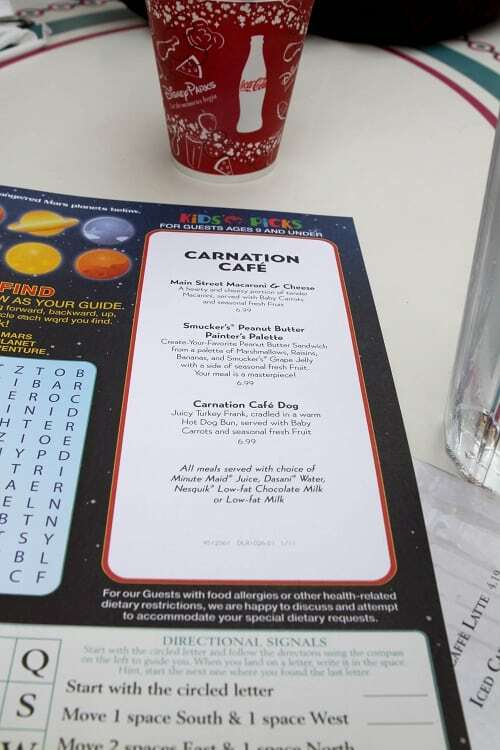 Here’s a peek of the lunch menu you get handed when you sit down. Choices, choices 🙂 Click HERE to see the entire lunch menu. 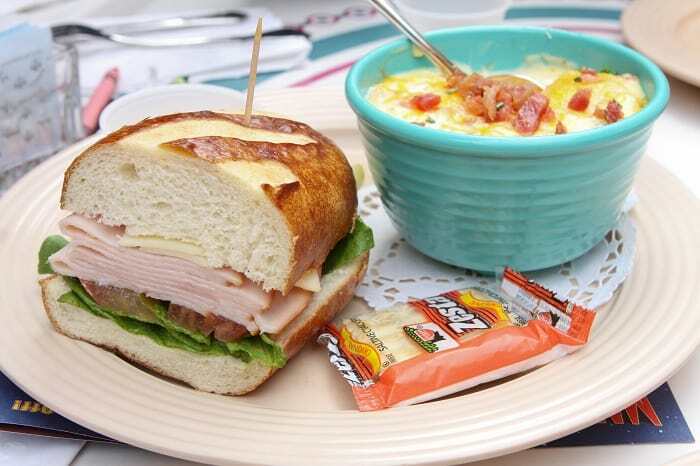 Here you have the Smoked Turkey Sandwich on Pretzel Bread with a side of Loaded Baked Potato Soup. The soup was the star of the show here. It was thick and full of my favorite baked potato toppings. I would definitely order this soup again. The sandwich was good, but I kept going back for the soup. A closer look of that fabulous Loaded Baked Potato Soup. This is a must order. 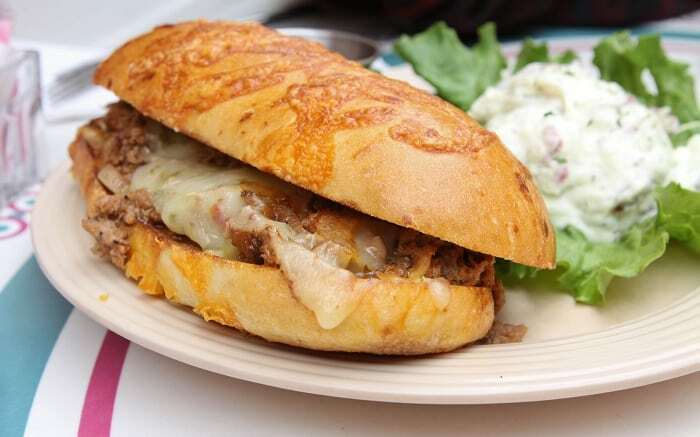 Here’s the Cafe’ Steak Melt that came recommended by our server. It was really good. 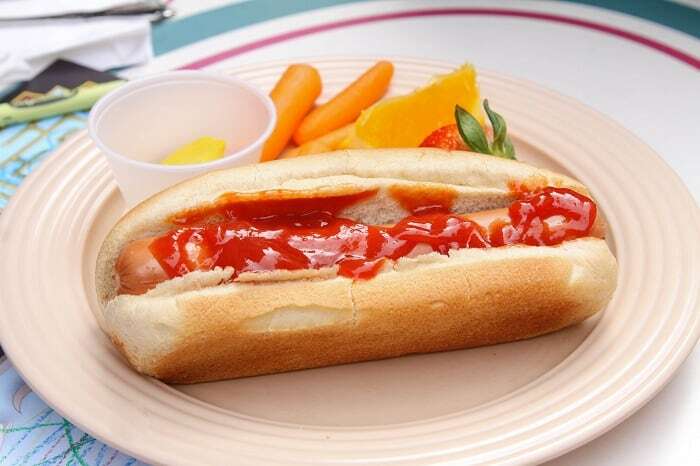 I loved the cheddar roll and dipping the sandwich into a side of A-1 Sauce. We chose a side of potato salad which was creamy and nicely seasoned. Here is the Croissant Chicken Club Sandwich with a side salad. The sandwich was probably my favorite sandwich that we ordered. 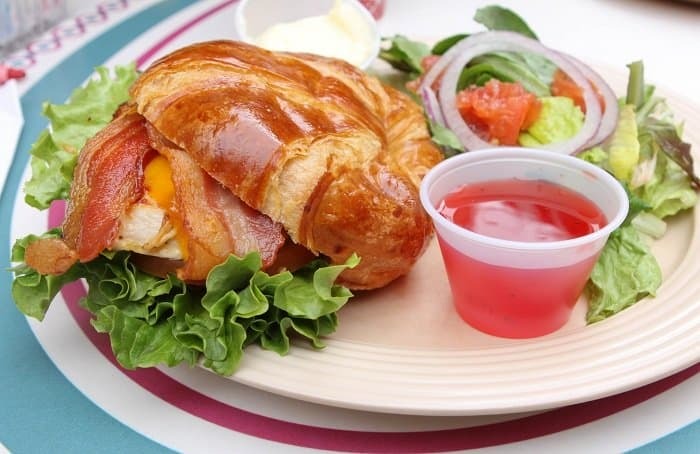 The croissant was buttery soft, the chicken breast was nice and moist and you can’t go wrong with cheddar and bacon. I would recommend ordering this one. 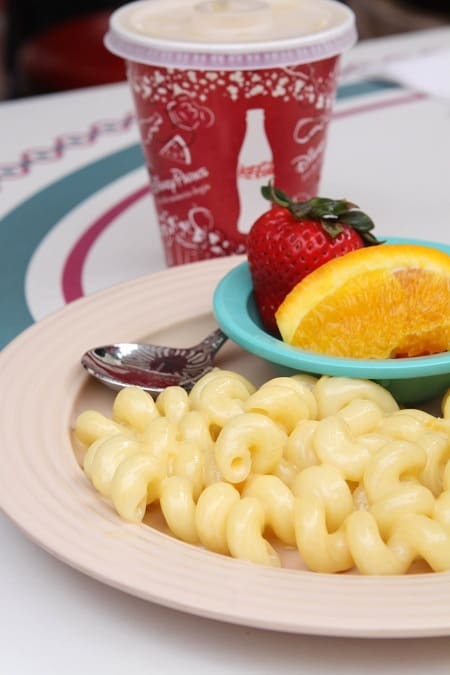 Kids menu with lots of kids favorites…mac and cheese, peanut butter and jelly which you can design into your own perfect sandwich and of course a hot dog. You know we are all about the desserts. Lots to choose from. Wishing we would have ordered one of everything to try them all. 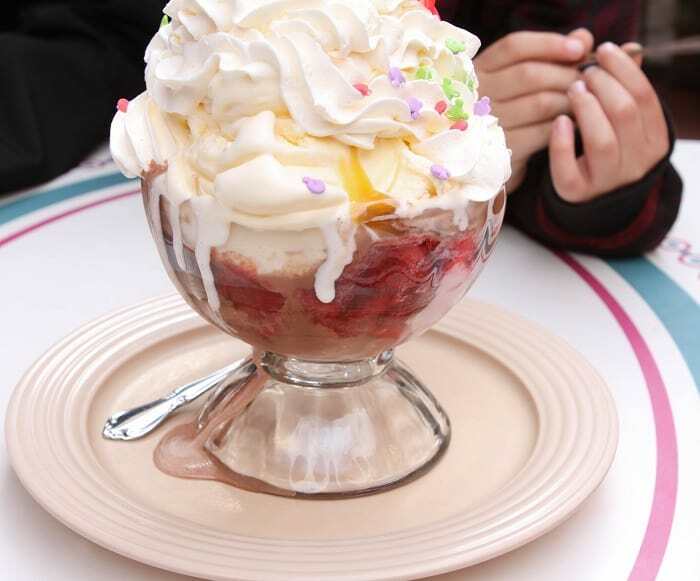 We went with this very small dessert…..The Matterhorn Sundae, Lol! 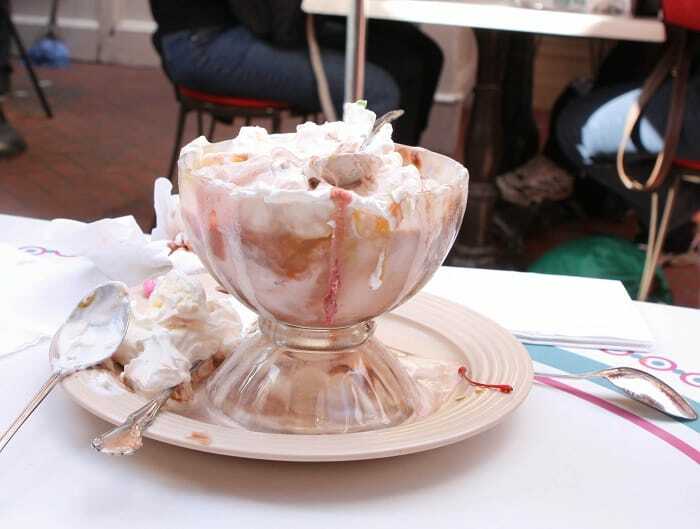 Four scoops of ice cream, caramel, strawberry sauce, hot fudge, whipped cream, Micky sprinkles and a cherry. Yikes! 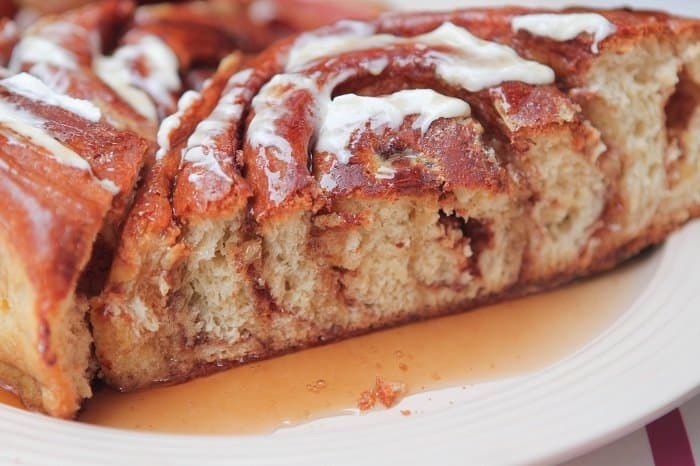 Word to the wise…eat quickly, this baby melts fast. See what I mean about the melting, Lol! Well, between the 4 of us, we did some damage on this sucker. 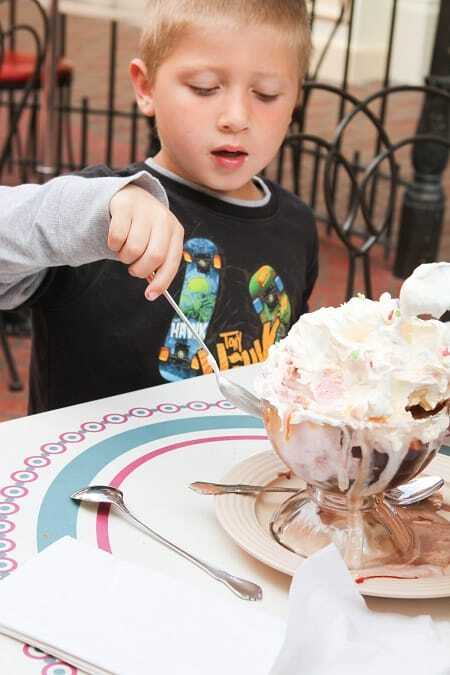 I give the Matterhorn Sundae a perfect 10 for presentation and fun. 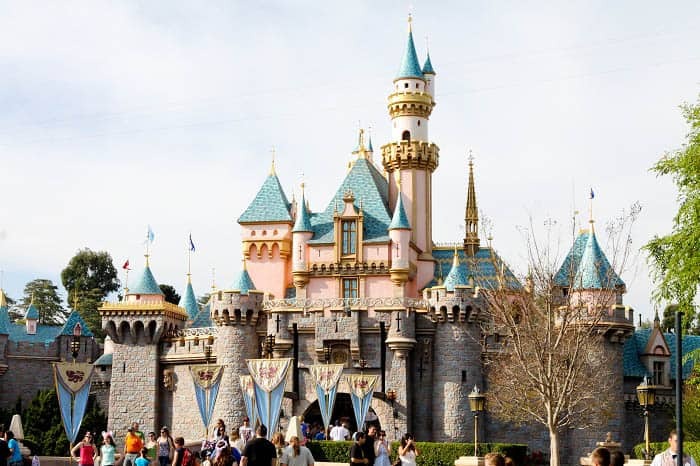 Have a magical….and Delicious day! 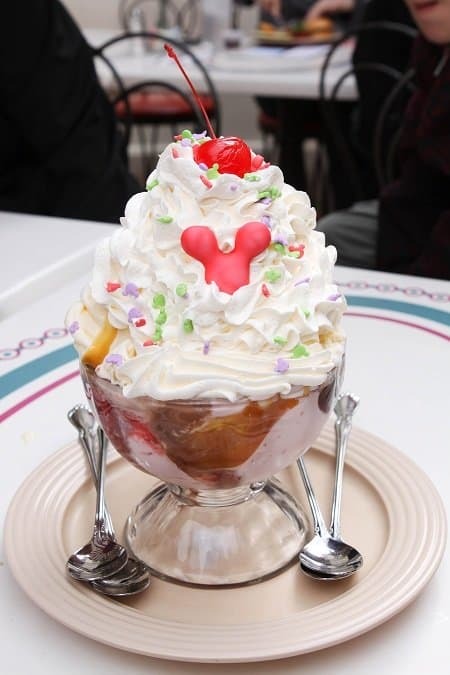 The The Matterhorn Sundae…I think that’s the cutest ice cream sundae ever! And I love that your boys are SO INTO it. 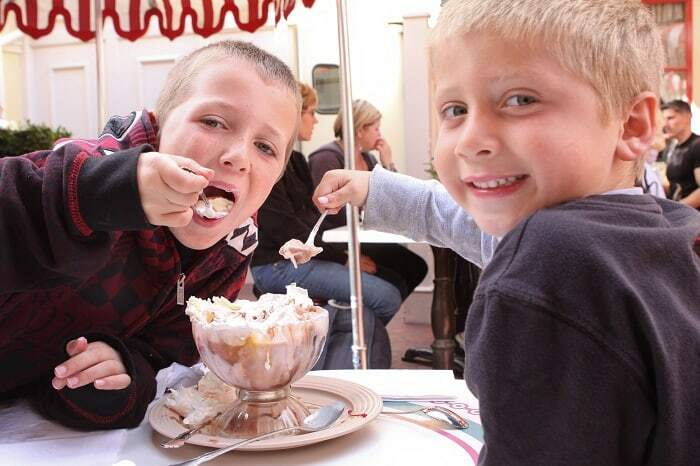 That’s what being a kid is all about: Disney, ice cream sundaes, and having fun! We definitely need to plan it! 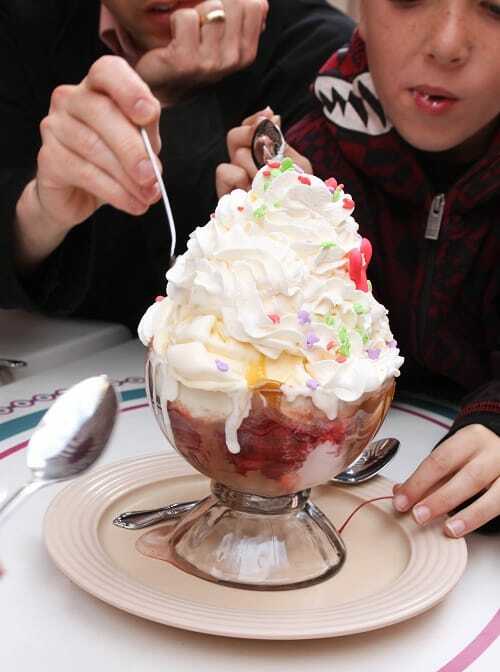 Oh my goodness – that sundae looks like so much fun!! 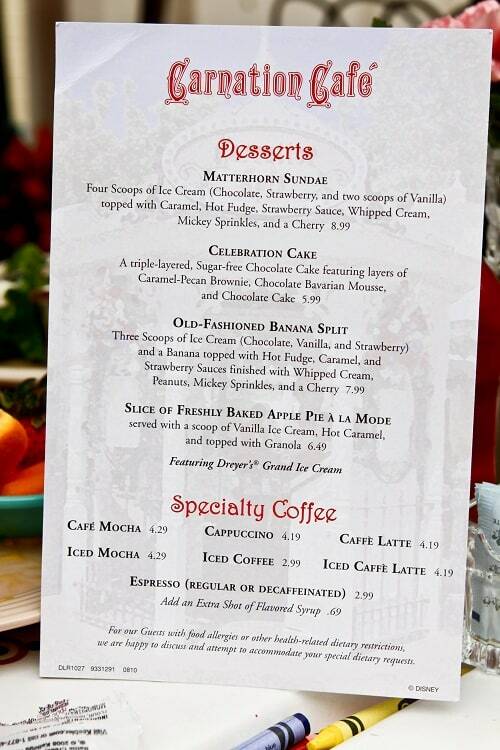 I love Carnation Cafe, though we usually go for breakfast. 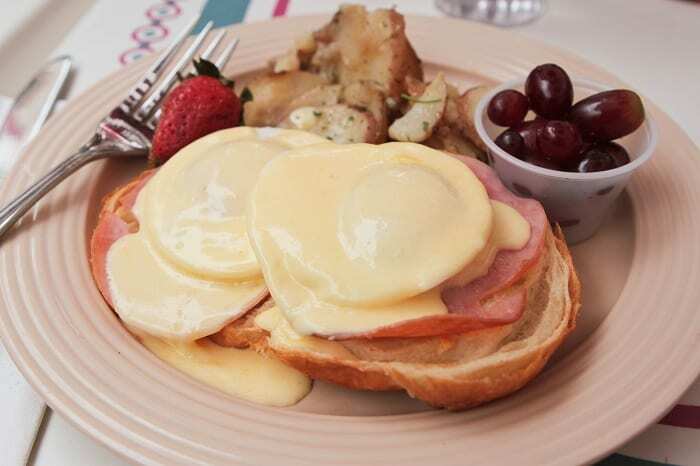 The croissant eggs benedict is awesome, and so is the Mickey waffle. Food is almost my favorite part of Disneyland! So excited to try Carnation for breakfast next time! You are so funny Kristen!! We loved Carnation Cafe! My daughter ordered the PB&J Platter!! It was great! She got two pieces of bread, peanut butter, grape jelly, raisins, chocolate chips, and marshamellows. OH, and I think bananas! It was a fun meal! We were there on a hot day and I loved the umbrellas for shade. Also, the chef came out and walked around asking people how they liked their meal! I would definitely recommend a reservation at busy times. Now I am wishing my boys would have ordered the PB&J Platter, next time 🙂 I’ll look for the chef next time too! So love these Disney posts. I usually end up not having enough energy to go back to Main Street to eat lunch. On a similar note, any coffee places not on Main Street you could recommend would be greatly appreciated. Again this is great! Thank you! 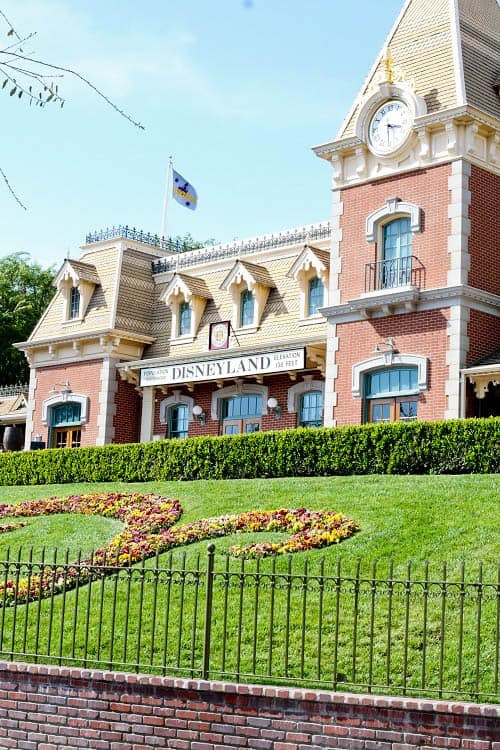 Great Review – my wife and i go to Dl every year – this year we did the Disneyland Half Marathon! – We love carnation – and sometimes call it Oscar’s – after the long time chef at the carnation – and they are expanding it – taking over the Blue Ribbon Bakery inside area………great review – the Chicken Cross Sand is my Fav – my wife loves Oscar’s Chef salad…thanks again,,,see you on mainstreet! I had the Three Cheese Veggie sandwich once when I was pregnant and let me tell you… I still crave that sandwich. I don’t know if it would be as good now but back then I was always craving cucumbers and the pretzel bread it comes on… AWESOME! We rarely eat here when we go but it sounds like we need to try it again! Oooo, I’ll have to try that veggie sandwich next time. Sounds wonderful! 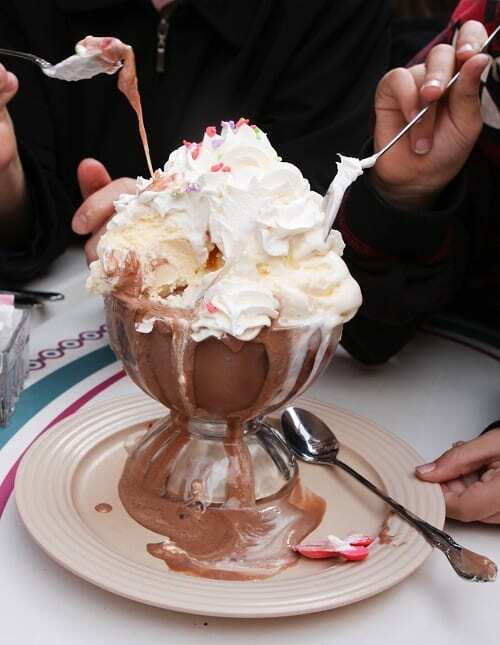 Wowzers, now THAT’s a sundae! So yummy. Thank you for the great pics and descriptions. A must stop for my family when we visit Mickey in October. Since I’m not LDS, I love the specialty coffee drinks there. 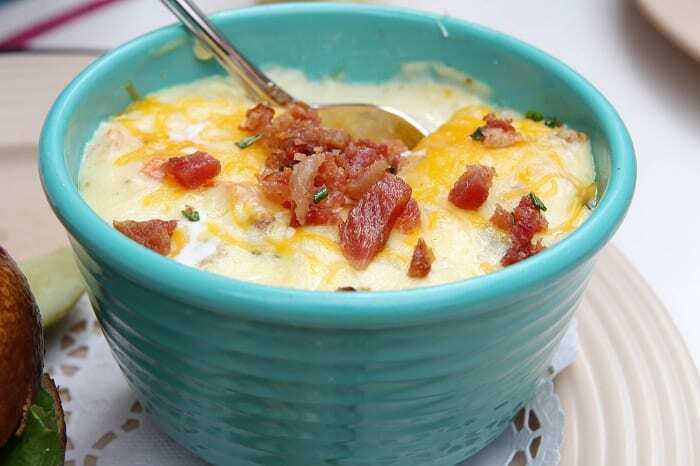 Loaded baked potato soup = WOW!!! It’s a freezing cold, rainy, thunder storming night in Melbourne, I would have liked nothing more than to eat this for dinner!! 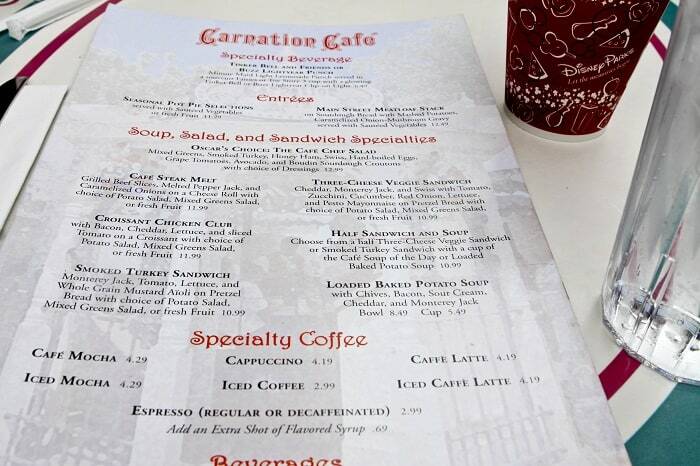 I am bound and determined to try Carnation Cafe for breakfast now!! Oh these dishes look so yummy! I’ve never had lunch (or dinner) there but I’ve always wanted to try. To date I’ve only had breakfast there. It really is a great place to have breakfast and people watch. 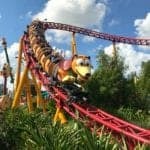 I love your disneyland posts. I’m taking kids there halloween, Cant wait. I hearde plaza inn has some good chicken dinners. 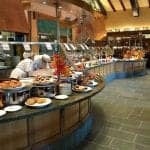 I went here once and it was a 15min wait, not too bad and the food was delish. The second time Yikes!! We waited one hour in line and then just gave up. This was on a Friday. The unfriendly hostess informed me that they take reservations and next I should try that. I don’t think I will. But if you’d like to try their yummy soups, look into their reservation system. Have to say, you make the most beautifull pictures. Truly inspiring as is your website! I can learn alot from it!